Hypothyroidism is a condition where your thyroid gland is not producing as much hormone as it should. This causes metabolic activities to slow. Undiagnosed hypothyroidism can make you feel run down, depressed, cold or tired. It can slow down your heart rate, make your hair dry and brittle, give you itchy skin, muscle cramps, infertility or menstrual disorders. 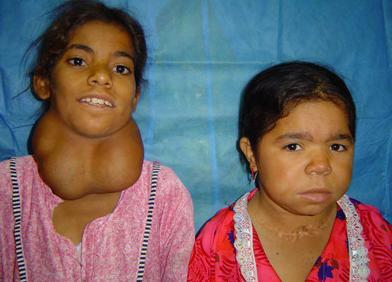 Extreme hypothyroidism can cause goiter (a lump in the neck that is actually the inflamed thyroid gland), facial puffiness also known as myxedema, yellow skin, weight gain and mental impairment. The condition is commonly treated by replacing the thyroid hormone that your body is not producing. The most common treatment involves supplementing thyroxin and monitoring thyroid levels for life... But there are herbs that can help with the side effects of hypothyroidism, even though it is not recommended that people try to go without the hormone. Left untreated, in addition to all the symptoms listed above, hypothyroidism can cause elevated cholesterol levels and increase the rate at which plaque builds up in your arteries. Some health food stores sell what is billed as a natural replacement for thyroid hormone. Because herbal remedies are not regulated as drugs, it is not known if these medicines are helpful or even safe. The best bet is to consult with your doctor about the level of hormone you need to take and supplement with professional formulated herbal products to give you a better quality of life. Black Cohosh is especially good for treating menstrual problems associated with hypothyroidism. It's a popular treatment for menopausal women, treats symptoms of PMS and may help with infertility. Kelp is sometimes given to people with hypothyroidism because iodine deficiency is linked to the disorder in some parts of the world. Cayenne supplements can help with blood circulation and making the heartbeat stronger. An improvement in circulation can alleviate the cold extremities that are common with hypothyroidism. Some studies indicate that there are certain herbs, foods and drugs that should be avoided if you have hypothyroidism. It is thought that stimulating the immune system in the early stages of the disorder can cause the thyroid to deteriorate at a faster rate, so avoiding those herbs can help you hang on to what thyroid function you have. Ginseng, astragalus, bamboo, burdock, echinacea, ginger and lemon balm are among the herbs that you should avoid in the early stages of hypothyroidism. There are other herbs that are recommended to be avoided as well as certain foods and medicine. Visit herbs for hypothyroidism to learn more. Monica Villarreal and Gail Kaufman are editors at yourbodycanheal.com. To learn more about valuable herbs for hypothyroidism and herbs to avoid visit: herbs for low thyroid function. To obtain a FREE health report that includes key foods and herbs for low thyroid function visit: natural health remedies.